BMW has lifted the lid on its 2012 M5 Concept ahead of its Shanghai Auto Show unveiling later this month, offering the first official look at what we can expect to see on showroom floors later this year. The online reveal follows a series of leaked images that surfaced online yesterday, letting the range-topping M sedan out of the bag. On the styling front, the M5 Concept borrows a few key cues from its smaller M3 stablemate, featuring a trapezoidal air dam in the front bumper flanked by large intakes. The rear end sees dual tailpipe tips at each corner, sitting either side of a small diffuser. A subtle bootlid lip spoiler rounds out the rear tweaks. The most important details, output numbers and performance figures, remain a tightly-held secret. BMW has confirmed in recent months however that the new M5 will draw power from a version of the twin-turbo 4.4 litre V8 engine powering the the X5 M.
Power figures for the new M5 are rumoured to be up around the 430kW mark - besting the X5 M by 22kW and the previous M5 by nearly 60kW. With the hefty X5 M able to sprint to 100km/h in just 4.7 seconds, we can expect almost supercar times from the new top-shelf M sedan. The new engine will be mated to a seven-speed M double-clutch transmission, with auto start/stop technology contributing to what BMW promises will be a significant improvement to fuel consumption. 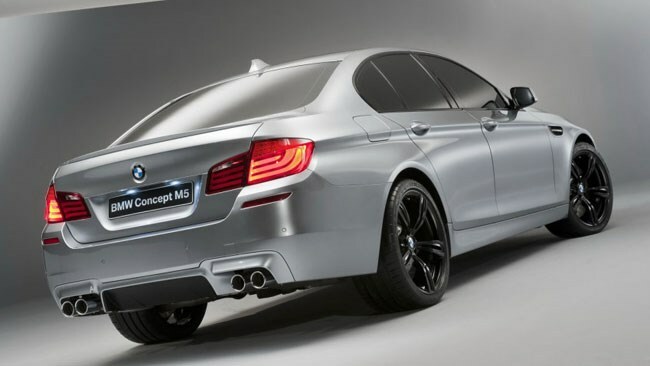 The new M5 will get the usual raft of M division upgrades, including suspension and brake upgrades. There is also a new Active M differential designed to optimise stability through locking torque between the drive wheels. More details will likely be revealed at Shanghai later this month, although a full rundown may have to wait until Frankfurt in September.